Tanith loves agility. Some dogs understand competition. Maybe Tanith will eventually, but right now she sees competition as just one more chance to run out there and have fun. She does like showing off, so to that extent she might see competition as special. Sometimes she decides she wants to go on the equipment she wants to go on . . . . ARRRGH is my usual response. My frustration is tempered by my amusement and pleasure in seeing just how much fun she is having. After attending several events with mixed results I have learned one thing. Agility people are very forgiving. You don't have to be good, you just have to try, and keep your perspective. Heavy criticism is reserved for people who get angry with their dogs and show it. While people love a great performance they also understand spirit and energy in a dog. If the dog doesn't perform there is no shame as long as the dog is safe and not disruptive. Tanith and I take classes where we practice with some focus. We also practice on our own using my equipment. I invite others to the practice sessions which I call JFF Agility. It is Just For Fun Agility because we are using equipment which is not standard, and we do not attempt to set up standard courses. I invite friends and family to come and play too. Mostly people who come are not competing and most have never taken a class. The equipment is lightweight, compact, and inexpensive. I try to make it colorful, but it isn't fancy. You can look at the JFF Agility Page to learn more. 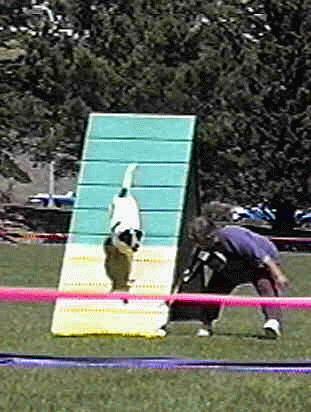 This page has some pictures and stories about our more recent exploits in agility. Below are some descriptions I wrote when I was first starting out. We did not do well this week-end. I had no right to expect that we would. We had only started in April 1995. Still it was really good experience. I just wish I had attended some tests first so I could have been better prepared. 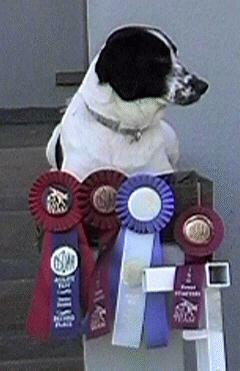 On May 26, 1996 she made her first qualifying run at an agility trial. I was soooooo relieved. At last I knew it was possible. The next day she didn't qualify, but she did take a second. I learned to take a deep breath and keep going. I almost quit on that run because she was acting a little wild. I'm glad I stuck it out. Sometimes Tanith likes to take the tire the wrong way. Sometimes Tanith does the tire the right way. The first jump is often faulted by the dogs, and Tanith faults the tire more often than any piece of equipment. Another example of handler error. I should have been more careful in directing her through the tire. On the other hand the video these were taken from shows Tanith heading left while I head right. She really wanted to get on the dog walk. Arrgh. She racked up a total of 35 faults on this run. But she sure enjoyed herself. On this run she did the A-frame just right. If I recall correctly this run resulted in her first USDAA qualifying run. Well I don't have any pictures of this trial. My favorite photographer, Bill Newcomb wasn't in attendance. It's been more than a year since I wrote anything on any of the trials so let me update things a bit. We dropped USDAA trials for a little while because Tanith would once in a while yelp going over a jump, and sometimes she would refuse jumps. So I had full x-rays done. Hips, elbows, knees and back. Her hips are great, her elbows and knees are fine, but her back has spondylosis. All scientific names have a sort of ominous sound. Spondylosis is essentially arthritus. Since Tanith was barely six at diagnosis that is not so good, but it could be a lot worse. After her veterinarian did some checking around we decided that there was no advantage to entirely stopping agility. On the other hand the 24 inch jumps of USDAA did seem to cause her occasional problems. So we decided to continue in NADAC and wait until Tanith is a Veteran (seven years old) before going back and trying USDAA again. The tire problem I mentioned above? It seems pretty well gone. I can't think of the last time Tanith did the tire wrong. I've gotten a big help because the style of the tire jumps changed slightly. The ropes holding the tire in place used to come out at an angle, now most of the tire jumps we see have the ropes going straight down. With nothing to jump (the rope) between the tire and the frame Tanith seems to do it right. To give you some idea of exactly what I've skipped in updating this page let me tell you what level we were competing at this week-end. Elite. Yes, that's right Elite - the highest level. When we completed our Standard Novice Title I decided to keep Tanith at Novice a bit to see if I could gain some control. In NADAC you don't have to move up just because you earned your title. It's a wonderful idea. Well the next trial we qualified in every run except Gamblers. So I decided that at the next trial I'd try Open. I can't remember the exact date of that trial. I do remember the mix of emotions. It was the oddest sensation. I was sorry I qualified in Open. I know. It sounds crazy. But sometimes one qualfies and isn't really quite ready. That is what happened. We had a wonderful qualifying run, but only one wonderful qualifying run. The rest of them were pure Tanith, wild, crazy, not quite controlled. We needed more work. The thing is that if you choose to compete at a level and you qualify then you don't get to go back. Sensible rule. Maybe it was a good thing too because it pushed us a bit. I started to practice with a bit more focus. The rest of the trials were not all that distinctive. We had fun at every one of them. Sometimes we did well, sometimes we did not. This time when Tanith got her Open Title I was committed to waiting. There was a point at which we could have competed in Novice Gamblers, Open Standard, and Elite Jumpers. My mind boggled. It was also comforting to note that despite her back problem Tanith could put is some truly wonderful jumpers runs. We had some runs that were nothing short of exhilerating. I also found, as time went on, that I was more able to honestly accept and let go of our less then perfect performances. Finally came the day when Tanith completed her Novice Gamblers title. It took almost two years. Now I was starting to feel like we had some degree of competency. Tanith's first qualifying run in Open Gamblers came very quickly. We continued to run in Open Standard and Open Jumpers even after we titled in them. With the coming of the New Year and with Tanith's seventh birthday looming on the horizon I decided to move up. In December when I sent in the forms for the Superbowl week-end trial I registered Tanith for Elite Standard, Elite Jumpers, and Open Gamblers. So here we are. All caught up and ready to start a new chapter in our agility story. It was at the Fairgrounds in Santa Rosa. An indoor arena large enough to hold two rings. That was fortunate because it was raining (nothing like competing in the rain - sometime I'll add that story). Anyway, I went out to walk the first course. It had a couple "traps" in it. The tunnel was right next to the dogwalk. And there was a strategically placed wrong jump. I carefully planned exactly where I was going to be, which direction I would move, when I would give commands. It wasn't easy, but it didn't look much harder than the open courses we had been running. I was wrong. Elite isn't much harder in one sense, the course set up. On the other hand it is a lot faster. There is absolutely no time to make mistakes. And we made them. We had a thirty fault run, then two ten fault runs, and that isn't counting time faults. We were over time for each run anywhere from six to fourteen seconds overtime. I took much consolation in noting that we were running very similarly to the others that had just moved up. I can honestly say I wasn't much more than mildly disappointed. I was satisfied with our performance. I didn't think we had embarrassed ourselves. There is something important to know about competing at the Elite level. It is not just another step up. It is the final step up. So teams newly moved up from Open are competing at the same time as teams who have competed and qualified in Elite many times. It takes ten qualifying runs at the Elite level to earn a championship. So when in one of our Elite Standard runs we made the same mistake as a more experienced competitor, and she still managed to qualify but we didn't I actually took some comfort in it. It kept me grounded. Everyone makes mistakes. The thing to keep in mind is are you having fun? If not, then why are you doing it? The last run on Saturday was Open Gamblers. I didn't like the look of the gamble. The first gamble obstacle was a straight tunnel that directed the dog toward a jump in front of it. To the left, at a forty-five degree angle to the tunnel was a second jump, the second gamble obstacle. The jump in front of the tunnel was a disqualifying trap. The third obstacle was another jump and finally there was the table. Tanith doesn't like to work away, although we had been practicing. I just didn't think that at the end of a long hard day that Tanith would work away from me to go over a couple jumps. I was wrong. I also will take this moment to feel great. Because I really had a part in making this one a successful run. This gamble really was one for handling skill. The trick was turning the dog coming out of the tunnel. So as Tanith entered the tunnel I stepped out away from the tunnel so that as she popped out I could coming running in toward the tunnel heading as if to go to that far jump. Tanith popped out of the tunnel, looked at me, saw where I was going, then turned toward that jump. Our timing was perfect. As Tanith became committed to the jump I turned to follow the limit line of the gamble and ran along side. I remember Tanith glancing over as if to ask "where the heck are you going?" But she saw a jump in front of her, and beyond was the table, her favorite obstacle. Over the jump and onto the table. I jumped for joy. I shouted "You did it!" And we ran off to our crating area to give Tanith a well deserved handful of treats. So now I'm waiting for the next premium to arrive in the mail. And I will get to check all the boxes "Elite"